The Clever Mailer for RAD Studio is a console application that allows you to send email messages in the text or HTML format with the DKIM signature to the specified recipient list. This article describes how to compose email message, put DKIM signature, connect to SMTP service and send the message to the list of recipients. The sending status is stored to the report file in text format. Lets go ahead and consider each of these steps in details. The message body can be represented in text, HTML or both formats. Each message body part is loaded from the file on the disk. The recipient list is loaded from the file as well. After the whole data is ready and the components are configured, you can loop through the recipient list and send mail to each of them. There is one important moment: you need to check whether the message has been aready sent before starting the process. Otherwise, the message may be sent twice or more times. The sending status can be stored in a report file for further analyzing. Note, the sending status may differ from the delivery status. The sending status indicates that the message was sent successfully at the client side. The most of email services may initially accept the email message, but not deliver to the recipient's mailbox. There may be different reasons why the message is not delivered: email filtering, mailbox unavailable, mailbox is full, etc. In such a case, you receive the non-delivery report. This report is sent by the email service to the sender's mailbox. The analysis of these non-delivery reports is out of scope of this article. We will consider this task in the next article. This functionality may be implemented with the BounceChecker component of the Clever Internet Suite library. Clever Mailer for RAD Studio can be used in RAD Studio XE3 and higher, including RAD Studio 10.1 Berlin. If you modify the sources and remove all references to the RAD Studio namespaces in the 'uses' sections, you can use the library in older versions of RAD Studio, CodeGear or Borland Delphi. 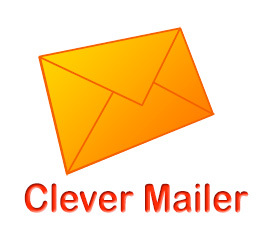 The current version of Clever Mailer for RAD Studio needs for the non-free library Clever Internet Suite. This is a drawback, and we suggest the task of changing the program so that it does the same job without the non-free library. Anyone who thinks of doing substantial further work on the program, first may free it from dependence on the non-free library. The class structure allows you to easily replace the Clever Internet Suite MailMessage, Smtp and Dkim components with any other third-party free and non-free software.